FEFSC Donation - Choose your own amount! If you have any questions, or need help with the ads, please contact Lynda at fefsc@fefsc.org. Personal advertising helps us to defray the cost of producing the competition. 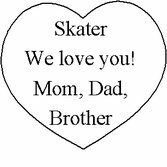 They also offer encouragement to your skater and make a great keepsake! We are offering three different types of personal advertisements in our Labor Day Invitational program this year. 1. The FEFSC Shout Outs will be short, 140 character or less, messages featured in the *FEFSC Shout Outs* section of our program and tweeted via our Twitter account throughout the weekend of the competition. These messages cost $5.00 each. 2. The Happy Grams are well-wishing ads that are printed in black and white in the program, usually from parents, grandparents, coaches, or friends. 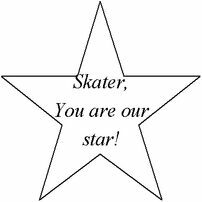 They are a piece of clip art with a short message inside and may be placed anywhere in the program. These messages cost $10.00 each. 3. The Personal Message Ads are 2.5 inches tall by 5 inches wide and are printed in black and white. There are six pieces of clip art to choose from to place into the ad along with your message of three to four lines. These messages may be placed anywhere in the program and cost $20 each. Fill out the appropriate form below and click the submit button to pay via paypal. Payment and information must be received by July 30th, 2018 August 16th, 2018 at 11:59 pm. Any ads received after that date will be included to the best of our ability, if time and layout permit. For any questions - Contact: Lynda Rowley at fefsc@fefsc.org. The message will be placed in a *FEFSC Shout Out* section of the program and tweeted via our Twitter account on show day. Your choice of design below will be paired with your message and printed in the program in black and white. The sizes are subject to change. Happy Gram Message - These Messages need to be as close the example as possible. Your choice of design below will be placed in a 2.5 x 5 inch box along with your 3 to 4 line message. Printed in black and white. Person Ad Message - Please keep it to 3 to 4 lines.